To Dr. W. W. Ely, as the pioneer in recording these unmapped portions, and making reasonably plain to those who should follow the devious windings of stream and trail, is due to the gratitude of thousands who have acknowledged the benefit derived from his valuable map of 'the New York wildness,' which, up to the present time, has been the only one worthy of name as such. William Watson Ely (April 30, 1812 - March 27, 1879) was a Rochester, New York based physician, wilderness enthusiast, and hobbyist mapmaker. Ely was born in Fairfield, Connecticut, and studied medicine at Yale, graduating in 1834. He married shortly afterwards and established a medical practice at Manlius, Onondaga County, New York. He relocated his practice to the larger city of Rochester in 1839, where he remained for the remainder of his days. 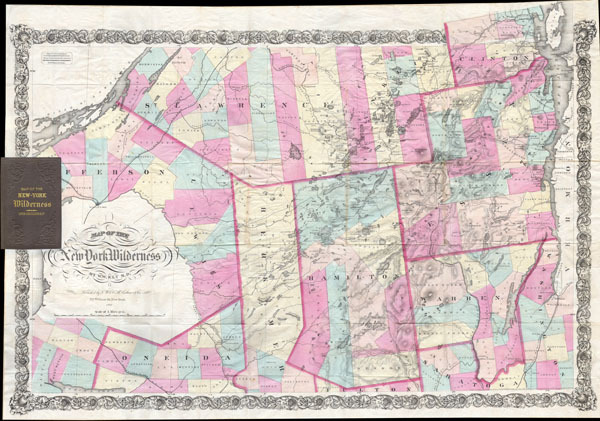 Despite his success as a doctor, Ely's is best remembered today for his remarkable mapping of the Adirondacks, completed between 1860 and 1866. His meticulous work produced the first accurate map of the Adirondacks and was the definitive map of that region for some 20 years. Ely died in Rochester of heart disease in 1879. Very good condition. Minor wrinkling along original folds. Minor wear and occasional verso reinforcement at original fold intersections. Attached to original brown linen booklet with gilt stamped title. Generally speaking, very impressive condition. OCLC 898476387. Marshall, G., 'Dr. Ely and his Adirondack Map,' New York History Vol. 35, No. 1 (January 1954), pp. 32-48. Stoddard, Seneca Roy, The Adirondacks, page 7. Phillips, Lee Philip, ,i>A List of Maps of America in the Library of Congress, page 514.